BB members clear the way! Members of The Boys’ Brigade have stepped up to help local communities cut off by severe winter weather. Members and leaders in several Scottish communities have cleared snow, gritted pathways and even got essential supplies to cut-off residents. 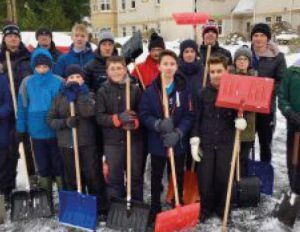 In Dunblane 40 young people, leaders and parents met with shovels and spades, ready to clear snow for some of Dunblane’s more vulnerable residents. Starting at two ends of the town, the boys visited homes in pairs and groups, shovelling snow, clearing and gritting pathways, and offering to collect groceries at local shops for those whose supplies were running low. A group of three boys even cleared the two footbridges over the snowbound railway at Dunblane station. The young people received an enthusiastic welcome at each home, especially in sheltered and retirement housing areas, as well as much encouragement and affirmation from passers-by. These were similar scenes in other parts of the country involving members of 1st Bearsden, 4th/5th Fraserburgh, 212th Glasgow, 1st Overtown, as well as other areas. One of BB helping on the day, Fraser Boyd, 25th Stirling (Dunblane) said “Giving service to the community is a big part of Boys’ Brigade membership, right from the youngest boy through to those achieving their Queen’s Badge. Two members and BB leader of 135th Glasgow, based in Scoutstoun, used the ‘Beast from the East’ to help others in a different way. Paul Clelland and his sons, Fergus (10) and Rory (8), swapped the comfort of central heating for an overnight in their very own Igloo and have raised over £2,500 for homeless charity Glasgow Night Shelter for Destitute Asylum Seekers. Also helping in the construction were BB members Tom Connolly (10) and Calum Duff (10).